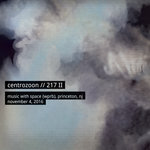 CZ217II | released April 3, 2018 | Recorded live on the 20th Anniversary Tour at WPRB, Princeton University, Princeton, NJ, USA on November 4 2016. The performance and the interview are unedited and the mix is just like what was broadcast. That might include clicks and digital dropouts. Markus’ forgot to push the record button on his computer, so his new mix here is missing the first 20 minutes of the piece. .
Second show of the tour and we’re visiting what feels like a second home to us: Mike Hunter’s show Music With Space, on Princeton University’s WPRB. Mike is a good friend of ours, and Music With Space has been very good to us! Markus and Bernhard have both performed live on the show several times before on their respective solo tours, so this was one of the first shows we booked as there was no way we would miss playing here as centrozoon. The band is in top form as you can hear, the familiar and friendly environs playing a big part of that. Mike’s post-performance on-air interview with Markus and Bernard was essentially catching up with old friends. Many thanks to all who tuned in to listen, and a big thank you to our friend Mike Hunter!